See the Eau Galle Lake website for additional information. Primary recreational opportunities are listed below. Directions: To the Day Use Area: From St. Paul, MN, 40 miles east on I-94 to Exit 24. 10 miles south on County Road B, follow signs. To Highland Ridge Campground: From St. Paul, MN, 40 miles east on I-94. From I-94 take Exit 24, 2 miles south on County Road B to County Road N. Turn east on County Road N and go 2 miles to County Road NN. 2 miles south on NN to campground entrance. Factoid: The Main Day Use Areas is located in a scenic area with steep hills, valleys, bluffs, streams and lakes. 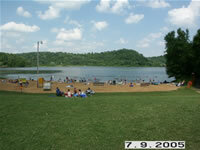 Highland Ridge Campground is located in a heavily wooded area approximately 4 miles south of I-94.